* * UPDATE * * See the old Howe Library desk in action on a Friday night! 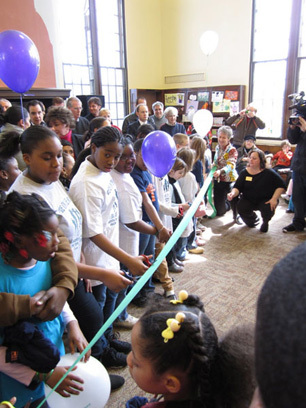 The “Grand Opening Celebration” of the John A. Howe branch library was held on March 27, a Saturday. Actually, the library had been open for more than a week and was already seeing heavy use. Folks sat reading and using the computer terminals while more than a thousand people filed through the building inspecting the renovations. The interior of Howe Library is filled with natural light that pours through the giant wooden windows and thoroughly illuminates every corner. In effect the outer walls are made of light, sort of like an old fashioned gothic church without the stained glass. Indeed the the place brings up a feeling of awe as soon as one walks through the front door, a religious urge for learning and open communication. Before the renovations the place looked old, dismal and worn out, so bad that the library administration originally planned to tear down the building. As I wrote two years ago, that was not acceptable to those of us who live here and pay taxes. 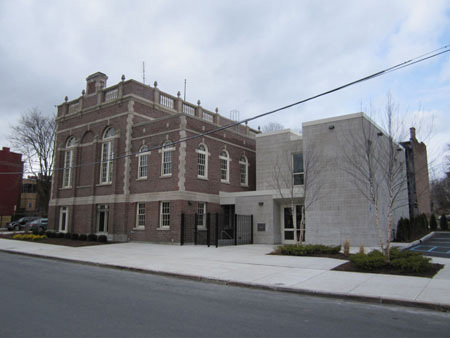 Since the library managers needed South End votes to pass the facilities bond act, they granted a stay of execution and promised to upgrade the building while preserving architectural integrity. 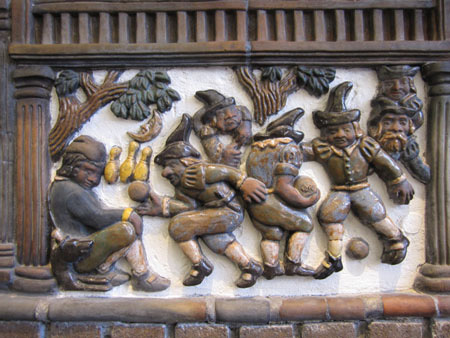 We were all pretty skeptical of their promises, and some of us fought them over details, particularly the fate of the wooden windows. Bur overall, I’d have to say we have a success here, a public facility that will serve the community as a center of cohesion for at least the next hundred years. The main floor of the library is now divided by wood and glass partitions that allow light to circulate, that give a sense of privacy without making the library user feel isolated. Tim Burke, who was acting director of the library system when the big decisions were made, told me that the original design for Howe called for these partitions but they were never installed. He seemed very pleased to have had them installed, I have to say that they work very, very well. This is an interior design for other libraries to copy. 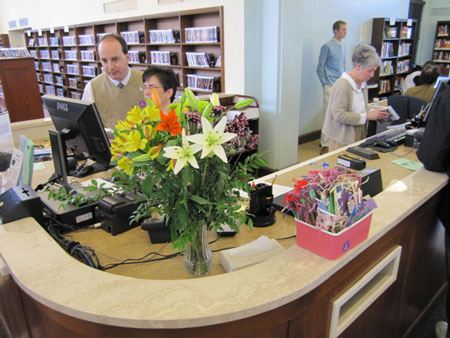 The librarians are proud of the new custom made front counter, a marvel of ergonomic efficiency that wraps around the center of the floor. The old oak desk that sat next to the front door was lovely but not very useful, having numerous file card drawers and mysterious openings. I happen to know that the old desk is enjoying retirement as an occasional food and drink bar located just inside the entrance of a former church that is now a private residence on Delaware Avenue. The officials gathered in front of the fireplace to do the dedication, the speechifying didn’t go on too long. 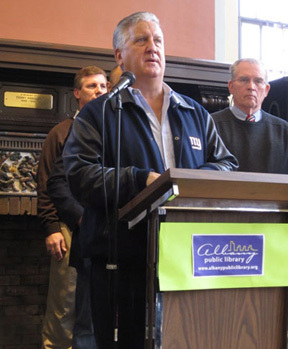 Of course Albany Mayor Jerry Jennings was in attendance, but interestingly He was not the star of the show. He waited quietly in the background as the library people congratulated each other, several speakers apologizing for preceding The Mayor at the podium. This was more or less appropriate protocol since Jerry Jennings has had little direct involvement with the Library Facilities plan and the reestablishment of neighborhood library branches. This is generally a good thing, the most successful projects which Jennings has initiated are the ones in which He has personally interfered as little as possible. 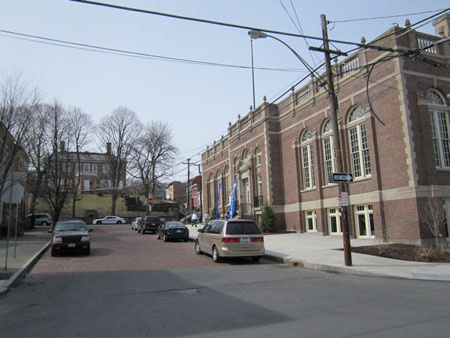 An excellent example of that is the South End Action Committee (SEAC) which is showing spectacular results in the immediate neighborhoods surrounding Howe Library. 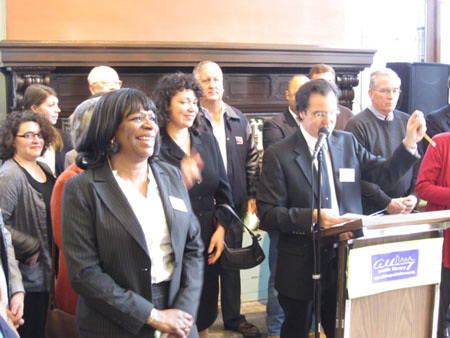 But it is a fact that we wouldn’t be celebrating the renovation of Howe Library without The Mayor. It was Jennings who removed the library system from the regular City budget and allowed the creation of an independent elected board. Like the elected public school board, the library board has the power to levy taxes and bond for construction projects, all subject to voter approval of course. At the time many people assumed He had “offloaded the libraries” merely to balance the budget. Whatever His original intentions, a number of passionate citizens saw this offloading as an opportunity to rebuild our libraries and expand our library system. 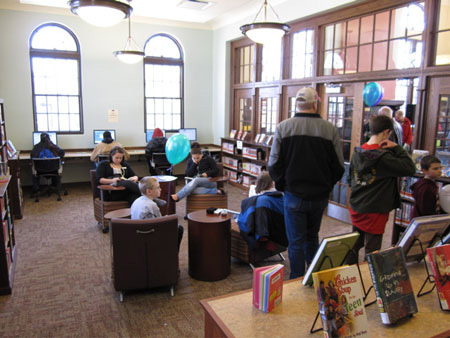 Consequently the citizens and taxpayers became aware of the importance of our neglected branch libraries, particularly during the give and take with the public that preceded implementation of the plan. I really couldn’t say if The Mayor intended this kind of result, whether or not He had a long term strategy in mind. 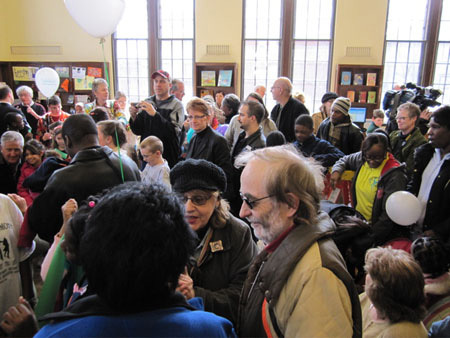 But here we all were inspecting the new Howe Library because of The Mayor’’s policies. See? I’ll bark at The Mayor and snap at His ankles all day long, but when the man does something right, intentionally or not, I’ll give credit where credit is due. In His remarks, Jennings seemed anxious to assure the audience that He cared about the South End and very much supported it’s revival. This seems to be a theme lately in His South End speeches, certainly good to hear. But with politicians words are cheap, it’s the results that count. At the end of the speechifying a whole bunch of kids emerged from one of the side rooms to cut a symbolic ribbon in front of the podium. Scissors in hand, they lined up and counted down “three. two, one...” and cut the ribbon to, um, ribbons. Thus the library officially opened. The TV crews dropped in for the dedication, the media reports were brief but positive, with one exception. The Hearst-owned Times Union sent one of their best photographers, the guy who wears the hats, and he took lots of photos. But the editors, true to form, selected from this fellow two cold, distant unappealing photos that managed to make the building look shabby, along with the flat caption, “Howe Library Opens.” How very typical of the Hearst Rag and their attitude toward the South End of Albany. The basement of the building used to be a dismal cavern, but now it has two very attractive community center rooms, one large the other small. The rooms are designed so that they can be used after regular library hours by community groups, with a separate entrance to the outside. During the event the smaller room was being occupied by a group of children busily cutting up and pasting construction paper at a long table. The larger room had all the food and drink. The library managers went all out, there was plenty of good edibles such as cut up melon, and there was sweet stuff. I watched several parental units wag their fingers at children grabbing too much cake, there was plenty for all. The next day I returned to inspect the exterior of the building. 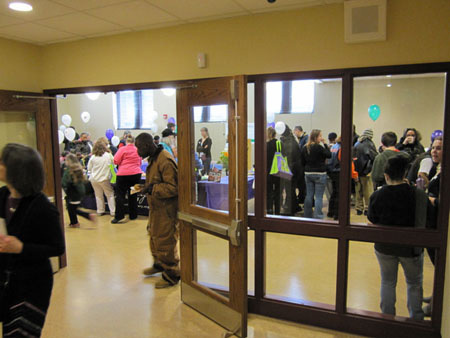 When plans for the building were being discussed, there was grudging acceptance all around that an exterior addition needed to be built to provide handicap access, elevators, fire escape, and after hours access to the community rooms. And bathrooms, let’s not forget that. Only a few activists mourned the loss of the shabby little park upon which the addition is built. I’m convinced that the precipitous decline of architectural beauty in America these last 70 years is due to table tops. You see, architects have gotten into the habit of designing their buildings to look good as scale models sitting on tabletops, which is where the point of sale occurs. Inevitably, these tabletop models look horrible as real buildings in the real world. Sad to say, these rathole boxes are everywhere. Well, no point in complaining about it anymore. At least the blocks from which the addition is constructed are higher quality than standard cinder blocks, and the interior is much nicer than I thought it would be. Also, blogger NY Cowboy has told me that additions to historic buildings in NY State are not supposed to match the original too closely, why I’m not sure. Is this true? 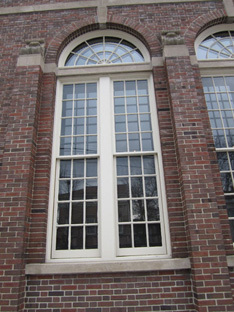 The big success is the preservation and refurbishing of Howe Library’s magnificent wooden windows. The wooden windows have been stripped of paint and glazing, repaired where necessary and set back into place without the ugly iron grates. Inside each window has a sheet of plexiglass (or possibly lexan) for climate control and security. Two years ago the citizens of the South End (and beyond) rose up to defend these windows after library officials announced that they planned to throw them in the dump and replace them with aluminum windows. We told the planners that this was not acceptable. As far as we were concerned, if you trash the wooden windows you might as well turn Howe Library into a hamburger stand. At first glance this seems an esoteric matter hardly worth the bother. But as was plainly evident to all who attended the Library’s grand opening on March 27, the interior of the building is defined and made unique by the light that pours in through these windows. We all understood that the quality of the light is defined by the quality of the portals through which it passes. This celebration of natural light goes back to the 12th century in our civilization, but somehow this aesthetic concern mysteriously disappeared during the course of the 20th century. Certainly this comes from a growing reliance on artificial light and cheap energy to illuminate interiors, perhaps an over-reliance. And of course naturally illuminated interiors do not come across on table tops. More simply for many of us the issue is one of communication between the inside of the library and the community outside. To turn Howe into a typical tabletop rathole, or even to move in that direction by degrading the windows, would be to continue to reject the surrounding neighborhood as unworthy. That, you see, is precisely what we are battling against. 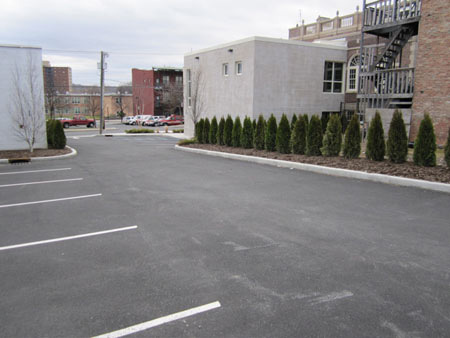 In my opinion, there wasn’t enough controversy over the creation of the 10 space parking lot. Originally two buildings, one vacant the other owned and occupied, were supposed to be demolished for to make room for this layer of asphalt. The architects and planners and library officials, almost all of whom were suburbanites, couldn’t even conceive of a building that did not have at least a token parking lot. And like all typical suburbanites they were fired up and hot to destroy as many urban buildings as they could. They managed to destroy the vacant two story mid 19th century wooden house. But the owned and occupied brick house hard up next the the library building survived. The owner of that building, who angrily refused a buyout offer, told me that the City has been coming down hard on him. “The City impounded my dogs,” he said, “because I tied them up outside and the workers didn’t like ‘em.” Admittedly, he is not an easy person to deal with. The City continues to fight with this fellow to clean up the exterior of his building, he continues to be angry and defiant. What’s the story with this lot, wedged between the parking lot and this fellow’s building? He told me in no uncertain terms that he did not own this lot. 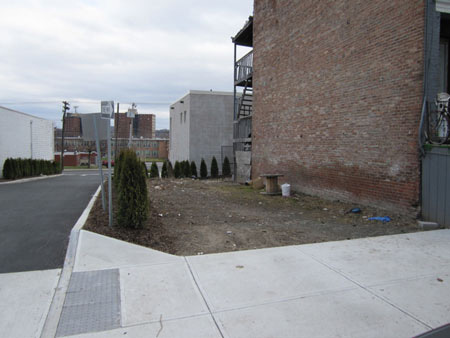 So where comes this nasty patch of dirt lined with shrubbery? I asked several library officials to clue me in here, but the response was deafening silence. This suggests to me that the story here may be very, very ugly and fraught with disputed legalities. If anybody knows some of the facts please pass it along to me. I’ve suddenly become very curious. The truth is that such friction around the exterior of the library building is inevitable. Naturally much of this unpleasantness could have been avoided by not trying to spread asphalt for suburbanites and destroy buildings. But this is an issue that is coming up repeatedly as revitalization projects begin to transform the South End. After some 70 years of planned decay and neglect by the City government, the people of the surrounding neighborhoods have become accustomed to living in decay and neglect. Naturally, they resist renovation and revitalization of their own neighborhoods as impositions by a belligerent government that they stopped trusting many decades ago. For example, this fellow who owns this building doesn’t seem to understand why the City suddenly wants him to clear off the highly visible pile of crap on his front porch. The City never cared before. I don’t know how to solve this ongoing problem of conflicts caused by revitalization, but I would guess that a heavy handed threatening approach by the government would consistently strike these urban survivors the wrong way. These ongoing exterior problems aside, the renovation of Howe Library can be declared a stunning success, a major event in the rebuilding of our community. The general expectation is that Howe will become a major defining center of the South End, an important portal through which outsiders will connect with our neighborhoods. Is the renovation of Howe all done with, or is it the start of positive influences on the surrounding neighborhoods? That, of course, depends upon the future attitude of the government. But we the people ultimately call the shots, if we continue to fight for our community and our architectural treasures then we can look forward to a South End that fills us with unqualified pride. Missed the opening so was glad to see your report! Congrats to the community for demanding and receiving renovation and not replacement of the historic windows. 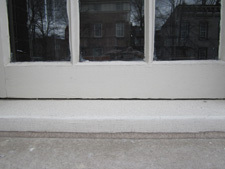 People tend not to realize how much preservation of original windows "makes" a building. 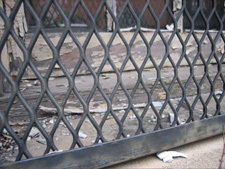 Removing them is one of the worst things that can be done to reduce the historic integrity of old buildings. And...I hear that architects now agree that new windows are not what they are cracked up to be to improve energy efficiency-and historic restored ones are actually better. If you want to learn more, contact Historic Albany Foundation. That new addition is hideous. I hope they have plans to demolish it with-in the next ten years or so. Understandably, they spent several million to dollars to build it, but as soon as the bonds are paid off by taxpayers, it has to go -- no questions asked. That said, maybe they could knock some holes in the walls, build a nice brick facade, and it will be beautiful. That would be cheaper then a complete demolition. They did a great job restoring the historic structure. The rest is horrific.